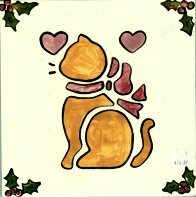 This handcrafted cat Christmas trivet was made in Colorado by a Colorado artist. This ceramic trivet is 7 1/2" square x 1/4" thich. There are 4 cork feet on the bottom to protect the tabletop. Lead free glaze. New.